Detail - race | Yamaha Motor Co., Ltd.
Yamaha Motor Germany team-mates Kevin Curtain and Broc Parkes had a busy three days in Qatar but found the optimum settings to handle the difficult track conditions, which were present almost throughout the test. The warmer final day provided a window of opportunity for the entire team and all the parts and machine settings scheduled to be tested were finally evaluated, resulting in impressive lap times. 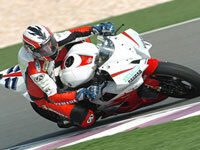 Curtain was fastest of all, by a single tenth of a second, setting a 2'02.5 with Parkes on 2'02.6, as they rolled out a new standard in the class at Losail. Despite the fast lap times the track conditions, even on day three, were not ideal for good rear tyre duration, although the team was particularly pleased to have found a front tyre from the new batch of choices, which withstood the demands of a gritty and relatively cold track surface. "Today was heaps better than the previous two, in terms of set-up and grip. We made big improvements to the suspension and we had lots of things to test. Unfortunately the first day was like riding around on a sandy tennis court! You couldn't test anything and the sand chewed out the tyres in two laps. Today the wind went away as well and a bit of rubber on the track helped traction. We got a good gauge on what tyres will work or won't work but we still have to work on the rears. Pirelli will sort that out, I'm sure." "It ended up pretty good. You could say perfect except for a crash I had in the morning of day two, but it went pretty well otherwise. We got through everything that we wanted to. The tyres worked well but the distance for the rear is the problem. It was too cold and too sandy on the surface and it needs to be warmer as well. Our times ended up really good but it would have been nice to have some even more competitive bikes around to benchmark us. I feel right on the bike, which is important." "Not such an easy test as it was hard to find tyres, set-up and everything. But on the last day we found a good set-up, good tyres, but we still have some issues with the duration of the rears. For fronts we should be sorted, even if it is warmer or colder in the race. The times are particularly good in the early laps but the track was quite cold at this test, and it should be hotter for the race."